Hey friends! 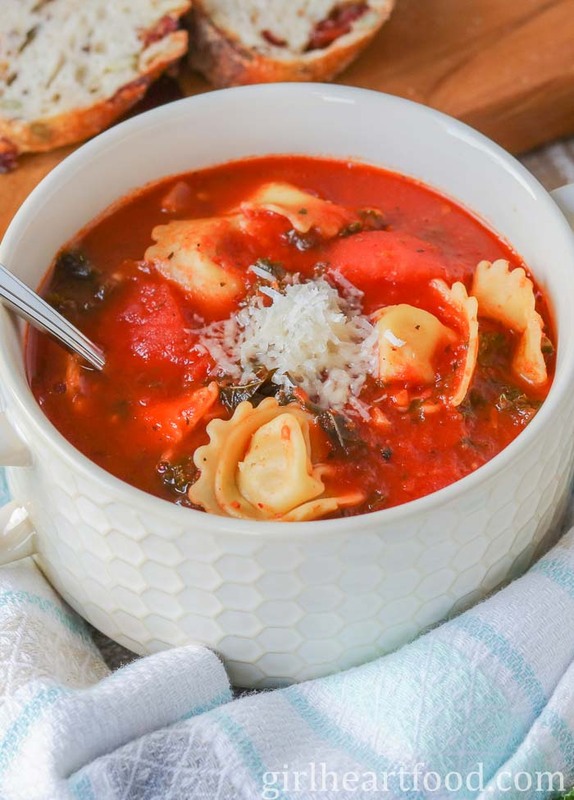 Though it’s technically spring, I still have a few delicious soup recipes to share with you guys before I go full on spring mode, like this super easy tomato tortellini soup. I dunno about you, but I could legit eat soup year round. You may have heard me say before…we do this thing in our home that I like to refer to as ‘soup Sunday’. Basically, every Sunday I whip up a batch of soup to enjoy throughout the week. It’s a great time saver for busy days and it’s always so nice to come home to a home cooked meal that just needs to be warmed up. Throw in a little bread or side salad and you’re set! Do you meal prep? 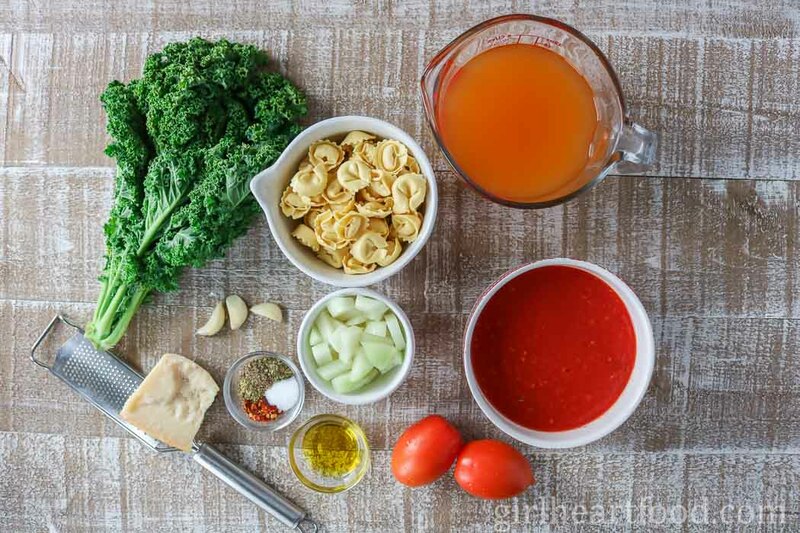 Though I do make soup on Sunday as part of our meal prep, this tomato tortellini soup can easily be made after a long day. Guys, when I tell you something is easy to whip up I mean it. From prep to finish, it comes together under 30 minutes. There’s nothing complicated or fussy here; it’s just simple, delicious food. I love it when you can take sensible shortcuts and still have a wholesome meal that you can feel good about eating. I often use store-bought rotisserie chicken as a time saver and this time I used store-bought cheese tortellini…ain’t nothing wrong with that 😉 What are some kitchen hacks that you like to use or shortcuts that make your life easier? I’d love to hear ’em! Using a knife, make an ‘X’ in the bottom of the tomato. Plop into a pot of boiling water for a minute. Remove and place in a bowl of ice water. The skin removes easily. Chop and use in soup or whatever recipe you like. If you’d rather skip peeling the tomatoes, that’s a-ok too! Just chop the tomatoes and proceed with the recipe. If your canned tomatoes are ‘whole’ or anything other than smooth, blitz with a food processor or crush with your hands/smash with a potato masher before using in this tortellini soup recipe. Brands and varieties of canned tomatoes vary in salt content, so keep that in mind before adding salt. I used unsalted chicken broth and, once again, if you used anything other than ‘unsalted’ keep that in mind when adding any seasoning. The tortellini used in this tomato tortellini soup were ‘cheese’ filled. You can used whatever variety you wish. Because there’s pasta in this soup, leftovers may thicken up slightly. Upon reheating, you may have to add a little stock to loosen. How Long Will Tortellini Soup Last? Store leftovers, covered, in the fridge and enjoy within 3-4 days. Kale was used in this soup, but baby spinach or chard would work lovely too. Keep in mind, though, that kale is a little more hearty than spinach. If using spinach, I would recommended adding during the last two minutes of cook time. Want to make this tortellini soup even heartier? Add in some cooked Italian sausage (or your fave variety) or cooked chicken. Don’t have tortellini on hand? Though it won’t technically be a ‘tortellini’ soup, other types of pasta would work in a pinch (think elbow macaroni, stars or other small pastas). Want a creamy tortellini soup? Stir in a little heavy cream at the end. Because of the pasta and kale, this soup is hearty enough to serve for dinner. It would also pair wonderfully with a green salad or grilled cheese. 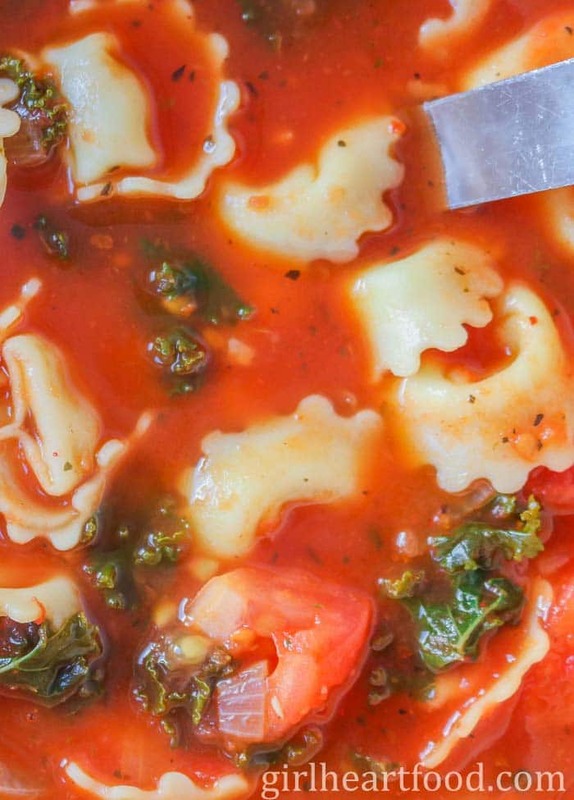 Hope you love this tomato tortellini soup recipe as much as we do! In a dutch oven over medium heat add olive oil. Cook onion until soft, about 5 minutes. Add garlic and cook 1 minute. Stir in basil, oregano, salt, pepper and chili flakes. Cook for 1 minute. Stir in canned tomatoes and stock. Bring to low simmer. Stir in tortellini, kale and fresh tomatoes (see text above on how to peel if you are doing so). Cook 6 minutes. Portion and garnish with parmesan. Enjoy! If your canned tomatoes are 'whole' or anything other than smooth, blitz with a food processor or crush with your hands/smash with a potato masher before using in this tortellini soup recipe. I used unsalted chicken broth and, once again, if you used anything other than 'unsalted' keep that in mind when adding any seasoning. The tortellini used in this tomato tortellini soup were 'cheese' filled. You can used whatever variety you wish. Because there's pasta in this soup, leftovers may thicken up slightly. Upon reheating, you may have to add a little stock to loosen. For recipe variations, see text above. I love the idea of soup Sunday! I’ve been making soup at least weekly since the fall 🙂 Can’t get enough of it! Wow! What a lovely bowl of soup. It looks so warm and comforting. I love how easy it is to make. I am saving this for my Meatless Mondays. It will be perfect. 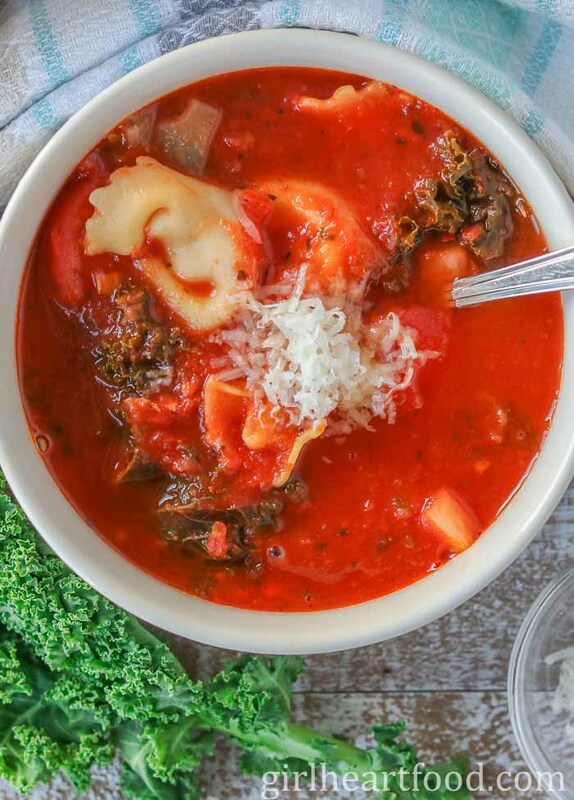 This tomato tortellini soup is so so pure and comforting! Love how it’s warm and cozy, but bursting with fresh flavors. I don’t mind soup at all, and we’re going to enjoy it until May for sure (And then probably switch to cold soup). And I do the same thing. Throughout fall – spring, each Sunday I make a huge pot of soup enough for the entire business week. It’s easy, budget-friendly, delicious (I do believe soup tastes even better after a couple of days), and honestly I want to enjoy cooking only on my weekends 🙂 Love this tortellini soup – decadent and super comforting. I love your idea of Soup Sunday. Years ago, I used to something similar with pasta. It was so nice to have something waiting at the end of a busy day. I live for tomato based soup and this one looks amazing!!! Can’t wait to try it. Our weather is finally agreeing that it’s spring, but we do still have a ton of snow covering everything. Wherever there isn’t snow, there’s mud! This soup looks perfect for anytime of year and I think it looks delicious. No daffodils yet, so I’m still all about soup! 😉 And this one looks hearty, healthy and SO delicious! Great tomato peeling tips too! I love how simple and delicious this recipe is. So satisfying for this time as year, as Spring is so slow to arrive. Thank you Yvonne 🙂 I love simple! Dawn, this is an awesome soup that I could definitely eat year round! It’s warming and cozy, while not being too heavy. So many delicious flavors in there and who doesn’t love tortellini!? Love that your make a bunch on Sunday and have it all week — I WISH I did meal prep, but I haven’t seemed to figure out the time for it. Ironic, in that it’s ultimately a time savor. 🙂 Hope you have a great week. So. Much. Yum. This is going in the “must make soon” pile. I love a soup with some color and texture! Thank you for sharing. An easy tomato soup is often just what I want! I love that it’s 30 min start to finish! And cheese tortellini? Super excitied for that! Thanks for the recipe, Dawn! Yep! So happy you like it 🙂 Thanks Laura! Just looking at this picture is warming me right up and making me wish I had a potful right now! Love how quickly this one comes together as well! I can totally eat soup year round! Especially if it has cheese filled tortellini in it! YUM! I’m all about those easy kitchen hacks. Although one thing I can’t buy is pre-cut veggies. They’re always so expensive! I’d rather save money and chop my own lol! Thanks for the tutorial on how to peel a tomato! I never knew how to do that. Definitely going to put this on my list to make! Haha…right 😉 ?? Thank you for the kind comment, Haylie! Enjoy, my friend! I love soups like this! Quick and easy, but delicious, filling and satisfying, too 🙂 Can’t wait to try this. With the types of springs we have around here, I’m looking forward to more of your soup recipes! This one looks particularly hearty. Love the addition of kale! Right 😉 ?! Thanks David! Hope you love it! Thank you Kelly!! Can’t beat that combo 🙂 Happy Monday to ya! I love the idea of soup Sunday!! Although, it might not work well with the kids as they aren’t big soup eaters. I’m working on that, haha. I personally love soup, especially tomato soup, and ESPECIALLY when there are delicious tortellini involved!! I didn’t have lunch today and now my stomach is mega rumbling staring at these photos, Dawn!!! Have a great week! I’m into any meal that’s made in under 30 minutes Dawn! And this looks so comforting and satisfying. Both Tom and I would love this soup! Pinned! I’m loving the sound of this. Thirty minutes AND there’s cheesy pasta involed–what’s not to love? 🙂 I’m so not a meal prepper but every once in awhile I get organized and make soup to store in the freezer; I think I’ll have to add this recipe to my repertoire. Can’t wait to try it!